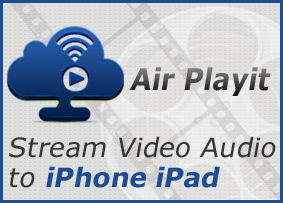 Digiarty Software announced the release of the iPhone/iPad app - Air Playit - on July 15, 2011, which is an evolutional streaming video software to stream video & audio libraries to your iPhone, iPad and iPod Touch via WiFi and 3G/4G networks. Without the need of video conversion, Air Playit can instantly play any video & audio files and share them with friends and family effortlessly. For iPhone/iPad users, Air Playit gives seamless access to video and music collections stored on both owner's and friends' computers on the go, even miles away from where you live. This video streaming app is compatible with the iPhone/iPod touch/iPad and available in the App Store. Please download Air Playit Server for PC/Mac OS and Client App for free before August 15 at http://www.airplayit.com. Act as personal cloud, Air Playit supports streaming 320 different video/audio formats from a disk folder or an iTunes library to your iPhone, iPad, iPod via WiFi, 3G and 4G networks, thereby letting users watch videos on the go. Air Playit is also a remote video converter, doing all the encoding on-demand. With the offline task manager, it can add a video conversion task using mobile devices and download the audio & video to your iPhone, iPad, iPod via a network. It also comes with the ability for seamless access to video and music playlists from any web browser with the built-in HTTP server. Thus, users can take advantage of VLC and Apple QuickTime Player to play the streaming video easily. 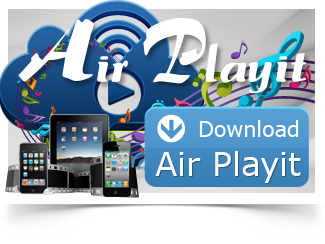 Air Playit enables users to stream music to your iPhone, iPad and iPod without converting or downloading beforehand. And the audio played will be cached to file automatically for playback next time, even there is no network. This video streaming app is completely self-managed. Three different permission levels are specified, including Admin, Public and Kids, so the shared content and data accessibility is always under user's control. If you are already an iPhone/iPad user, it will be imperative to leverage the existing capability to enrich the entertainment. Air Playit is a must-have app for users to enjoy movie videos and music on the go, or share them with friends and family.